If you’re familiar with the White Lily brand, you probably know it’s a Southern company, famous for flour that is used in biscuits. It’s been a very long time since they’ve introduced a new product, so they invited a bunch of mostly baking bloggers (and me!) 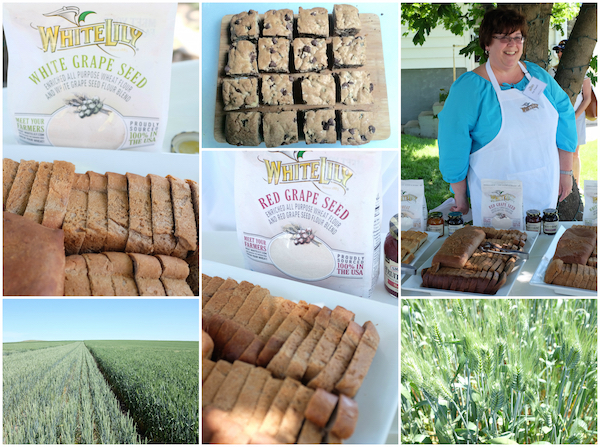 to come visit wheat fields outside of Spokane to learn about their latest venture—wheat flours with tracability and blends with red and white grape seed flour. Red and white grape seed flour from Whole Vine is blended with flour from Shepherd’s Grain and sold in 2 pound resealable bags. It’s designed to be an optimal blend, offering cup for cup replacement of all purpose flour. Plans are to offer it nationwide. Although the flour is a blend, each bag has a traceability code allowing you to see and learn more about a farmer whose wheat is in the specific bag. To produce the flour, White Lily partnered with Shepherd’s Grain, a cooperative that has roots in an 1888 farmstead farm. The goal of the company is to provide long term sustainability in agriculture. All the grower members of the cooperative are "no till” farmers who rely on the diversity of crop rotation, cover straw and soil science to try and imitate nature rather than fight with it. As a result they have fewer issues with rain erosion of topsoil, and concentrate on returning value to the land. I didn't know much about tilling so I asked a scientist about it and this is what I learned: Tilling dates back to 1790 when Jethro Tull advocated it in a book on farming. Initially plowing prairie led to yield gains, making nutrients more available but it also has serious negative consequences. Tilling leads to sterilization of soil, and 33% of organic matter is lost in the first two years after tilling. It also leads to greater needs for fertilizers, creating a viscious cycle. In changing over to this older way of farming, growers do need to invest in different types of seeding equipment. Bottom line? Healthy soil requires less inputs which is more economically and environmentally sustainable. Within Shepherd’s Grain most of the 42 growers have farms that are an average of 4K acres. Shepherds Grain also includes a seed company and a research company. Shepherd’s Grain is focused on quality and consistency of grain, rather than quantity. They want to reconnect farmers and food, so you know where your food is coming from, that's why there is a traceability code on each bag. The research company is very focused on the infrastructure of the soil and the diverse, dynamic habitat it creates. They are also trying to find a correlation between human nutrition and the micronutrients in grain. Apparently there is very little known about the terroir of grain, which impacts flavor significantly. 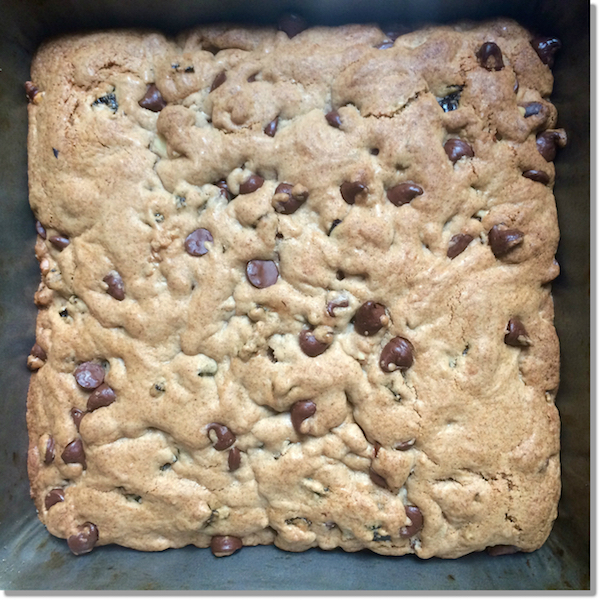 After trying a number of baked goods using the white and red grape flour, I adapted a recipe I found on Best Ever Cookie Collection and used the red grape flour which has a slightly sweet flavor profile and less gluten than regular 100% wheat flour. These flours are easy to work with, and add just hint of color. They are particularly good in dense desserts and crackers. Preheat oven to 350F degrees.Grease a 8x8-inch pan with cooking spray.Beat together the oil and sugar until well combined.Beat in eggs and vanilla. Add the flour, baking powder and salt, stirring until well combined. Stir in chocolate chips, dried fruit and nuts. Spread the batter evenly into the prepared pan and bake for 25 to 30 minutes, until golden brown and a wooden toothpick inserted in the center comes out clean. Let cool completely before cutting into bars. Disclaimer: My thanks to White Lily for inviting me to learn more about their flour and about Shepherd's Grain, and also for providing me with flour to use in recipes. I was not compensated monetarily for this or any other post on Cooking with Amy.